Mimas is one of the moons of planet Saturn. It is the smallest and innermost of all of them. It takes about 23 hours to complete its orbit around Saturn. A significant fraction of its surface is covered with a giant crater which also makes it one of the most crater poked objects in our solar system. This moon was discovered on September 17, 1789 by William Herschel. The giant crater is known as Herschel Crater named after William Herschel. This moon was named after one of the Greek Titans who was the son of Gaia and was slain by Hercules. The Herschel Crater covers about one-third of its face. It is 81 miles wide across and outer walls are more than 3 miles in height. With the exception of the Herschel Crater, all other craters are named after Arthurian characters. The face of Mimas is less than 250 miles across. Its mean distance from the Saturn is approximately 125,000 miles. This moon was imaged by Voyager I and II in 1980. Before that, ground-based astronomers could see it just as a dot. 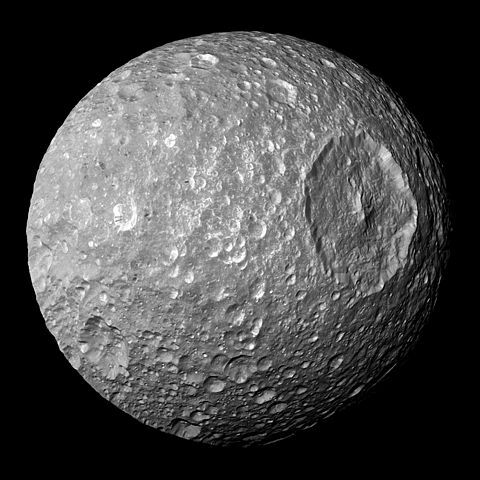 The mean density of Mimas is approximately 60 percent greater than that of water. Its surface is covered with many overlapping depressions and many of them reach sizes of 25 miles in diameter. NASA’s Cassini explorer was the first space probe that started sending back high-quality images of this moon. This moon is tidally locked. It keeps the same face toward Saturn as it flies around the planet. Declan, Tobin. " Fun Facts for Kids about Mimas ." Easy Science for Kids, Apr 2019. Web. 18 Apr 2019. < https://easyscienceforkids.com/mimas-facts/ >.